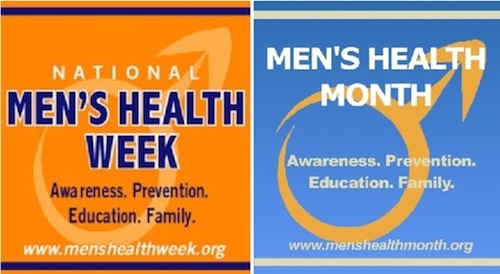 The purpose of Men’s Health Week is to increase awareness of preventable health problems and encourage early detection and treatment of disease among men and boys. According to the Mayo Clinic, the biggest threats to men’s health can often be prevented . Here’s a list of the top seven threats to men’s health and what you can do to minimize those risks. Don’t smoke. If you do smoke, quit smoking. Eat a healthy diet of fruits, vegetables, whole grains, high-fiber foods, and lean sources of protein. Manage chronic conditions such as high cholesterol or high blood pressure. Take steps to reduce your stress. Take a daily baby aspirin (75mg). Use sunscreen and protect yourself from the sun. Take early detection seriously. Get regular cancer screenings. AccidentsMotor vehicle crashes are a leading cause of fatal accidents among men. When driving, use common sense: always wear your seat belt, don’t drive under the influence of drugs or alcohol, and don’t drive when you’re tired. Avoid distractions such as the radio or texting and follow the speed limit (this will also improve your financial health, reduce stress, and help save the planet). Pay attention to air quality; steer clear of pollutants. Prevent respiratory infections. Wash your hands and get the yearly flu vaccine. Type 2 diabetesType 2 diabetes is the most common form of diabetes. It is a lifelong disease in which there are high levels of sugar (glucose) in the blood. To prevent type 2 diabetes, eat a healthy diet, exercise, and watch your weight. Research has shown that you can also lower diabetes risk by getting a good nights sleep.If you have diabetes, keep your blood sugar under control. Poorly controlled diabetes can lead to heart disease, eye problems, nerve damage and other complications. SuicideSuicide is another leading men’s health risk. An important risk factor for suicide among men is depression. Depression is serious: changes in heart function are seen during major depression. Effective treatments for depression are available. If you have signs and symptoms of depression, such as feelings of sadness or unhappiness and loss of interest in normal activities, talk to your doctor. The bottom line to men is to take these seven health threats seriously. The actions listed on this page will positively affect your health and increase the likelihood of living a long and healthy life. Men’s health: Preventing the top 7 threats. Mayo Clinic. Accessed 2012 Jun 13. Leading Causes of Death in Males United States. Centers for Disease Control and Prevention. Accessed 2012 Jun 13. Cancer Among Men. Centers for Disease Control and Prevention. Accessed 2012 Jun 13. Cancer prevention. World Cancer Research Fund. Accessed 2012 Jun 13.